Participant Voting in Decisions Lens provides a mechanism to gather informed judgments from decision participants in a distributed voting format. Decision Participants that have been assigned voting tasks will receive an email link and see a Voting Task in the Tasks section of their Homepage. Tasks will identify the name of the Portfolio and will state the type of request that has been assigned. Clicking on the Rate Alternatives task launches the Ratings Overview page. 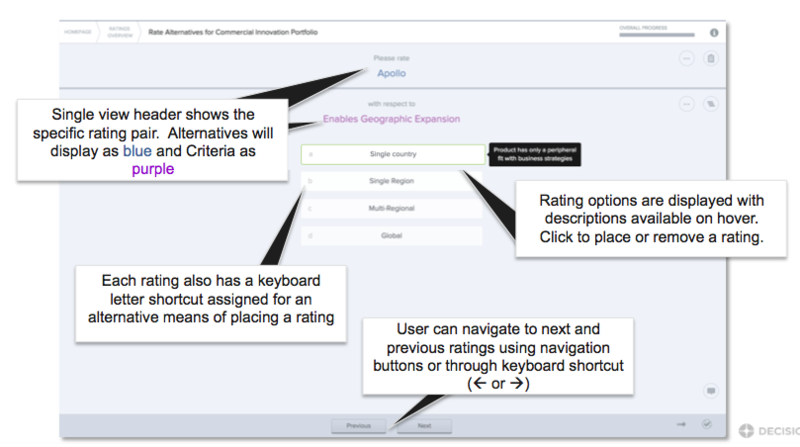 Ratings Overview provides a summary view of the voting task to complete. The top section details the total number of alternatives and criteria that the participant is assigned to rate. The middle sections may include custom instructions or supporting documents. 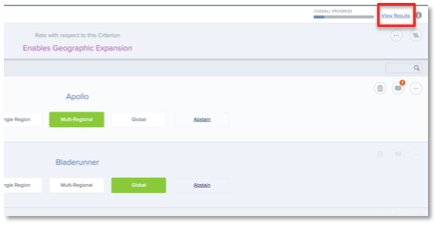 The right side bar details the Portfolio Name, Decision Goal, and Email address of the Portfolio Owner who is requesting the task to be completed. 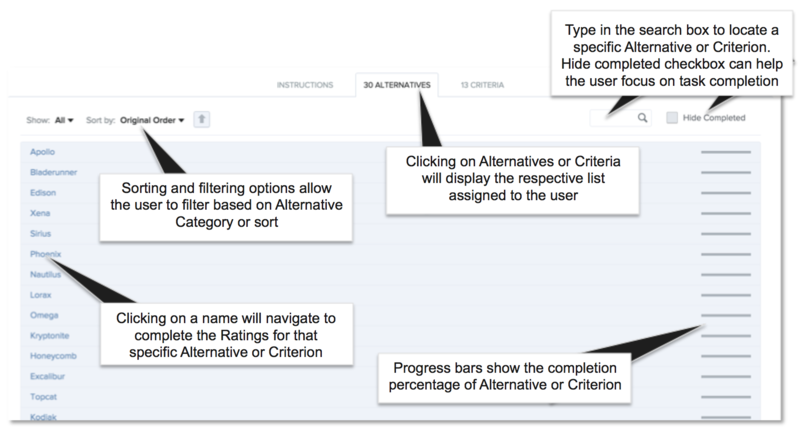 The Alternatives or Criteria tab displays the assigned list, voting progress and search, sort and filter capabilities to view and locate alternatives or criteria. Click on the Alternative/Criteria Name to jump to the voting screen. Single view shows the Alternative in the top banner and the criteria in the bottom banner with the corresponding ratings scale displayed in the main body of the screen. Click on the more menu icon to reveal the information panel for either alternative or criterion. Click on the scale value that represents your scoring preference. To change the score, simply click on another point on the scale. Once the vote is entered the scale value will highlight to indicate its selection. and the GO TO NEXT button will appear. Auto-Advance - When enabled, clicking on a rating will automatically navigate to the next rating without having to click “Next”. Manual navigation will reset auto-advance to off. NOTE: If a user leaves an in progress rating session and comes back, Decision Lens will remember your last view and take you automatically to the next rating. This view display's all alterative by a single criterion. Uses ca bulk rate by selecting (clicking the check box) for multiple alternatives. This will reveal a new dialog box where the user can select the rating to apply to the selected alternatives. This also works for clearing the ratings from multiple alternatives by selecting the alternatives and when the dialog box is opened, click a rating and then click again to deselect ratings for selected alternatives. There are several on-screen indicators of progress. 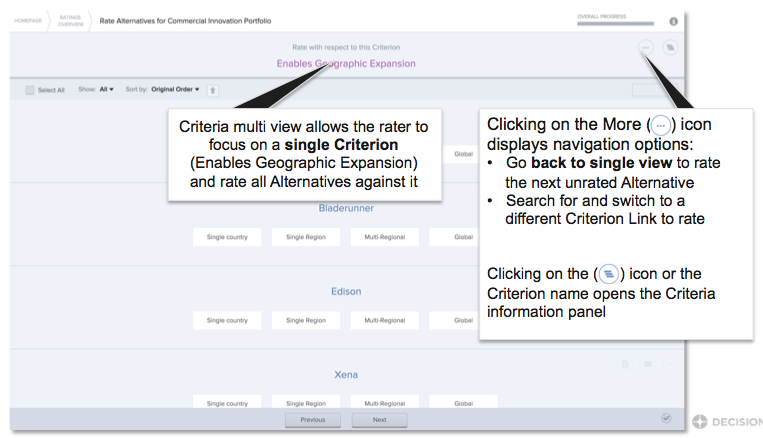 The Overall Progress is shown at the top of the page and in the More Menu, indicating the total completed Ratings for all assigned criteria and alternatives. The progress bar beneath the alternative or criteria name indicates progress for that screen view. Users can access the results from the upper right of the page. 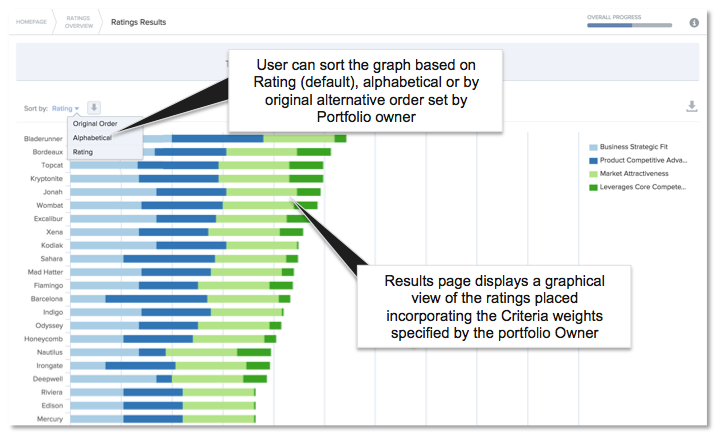 NOTE: The graphs is displaying the results of the individuals' ratings versus an unweighted criteria tree. 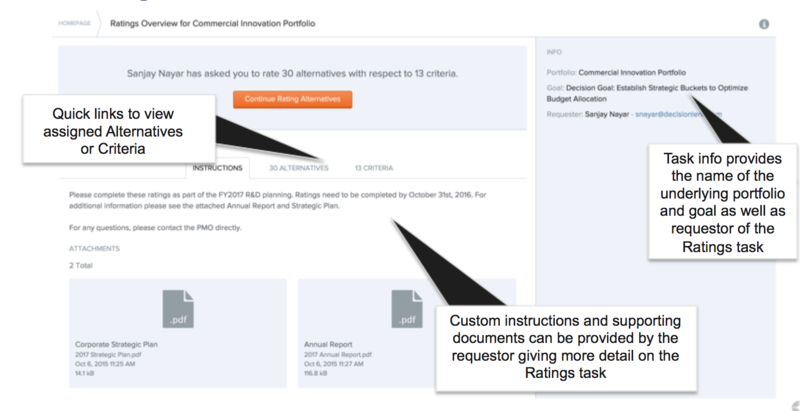 Portfolio Owners can modify the view for Participants in the Ratings Collection wizard.